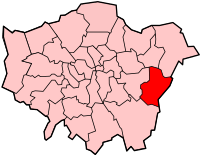 The London Borough of Bexley () is a London Borough in south east London. Hall Place, showing 16th and 17th Century wings. London Borough of Bexley Facts for Kids. Kiddle Encyclopedia.